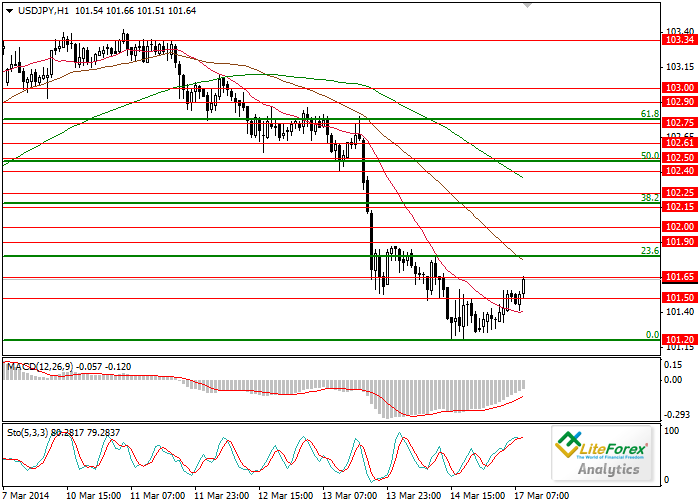 Last week the pair USD/JPY traded in the downtrend, experiencing correction after two-month highs at the level of 103.76. At first, weak Chinese data provided support to the Japanese currency, then negative US data intensified pressure on the USD. Closing level of last Friday was at the mark of 101.20, which was a strong support level. Main attention this week will be drawn to monetary decision of US Fed. The latest economic data have not shown the best results, which means that the pace of curtailing quantitative easing program will remain at the previous level. US news will be of importance, as, in case of positive news, the pair may shift to uptrend. Resistance levels: 101.65, 101.90, 102.10 and 102.50. Support levels: 101.50 and 101.20; the latter one is the main target of the bears, although they will need additional momentum to overcome this level. It is likely that the pair will trade in the sideways channel for some time. Sell orders can be placed after consolidation of the pair below the level of 101.20. Long positions are recommended above the level of 102.50.